Maize or corn has been the foundation for many great cultures in the New World, including those of the Inca, Maya and Aztec civilizations. Blue corn is one of the most unique corns found in the Southwestern United States. Blue corn is still an important element in Native American religious rituals. 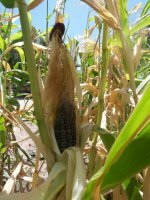 Most blue corns grown in the Southwest are flour corns. The kernels are made of soft, floury endosperm covered by a hard shell. A thin layer of the outer cells contain blue pigment, giving the corn its color. Blue corn often is ground into various flours or meals. These flours or meals are then used to make tortillas and chips. Nixtamalization is a traditional Latin American and Native American method of processing blue corn and other flour corns into tortillas. The kernels are boiled in a lime solution of juniper ash and water for a short period, then allowed to steep overnight. Then the drained corn is washed to remove the loose seed coats. The mash or nixtamal is then ground into flour to make dough for tortillas. It is generally accepted that Calabasas means "pumpkin," "squash," or "gourd," derived from the Spanish calabaza. Some historians hold the theory that Calabasas is a translation of the Chumash word Calahoosa. 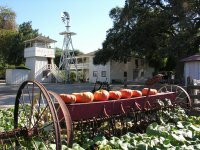 According to local legend, Calabasas got its name from a load of pumpkins that fell from the wagon of a Basque rancher in 1824 and sprouted the next spring. However, documents indicate that the earliest recorded use of the place name Calabasas dates to August 18, 1795, when Padre Santa Maria wrote in his journal that he slept in Calabasas while searching for a suitable location for a new Mission.